August is Fringe Season. This has nothing to do with hairstyles or sci-fi TV - we’re talking live performances. Although we heard on the grapevine of something going on up north, you don’t have to travel outside the M25 to experience some fringe action with the the Camden Fringe (which we are loving) and the Alternative Fringe festivals here to entertain us. On Sunday, Finger In The Pie's Alternative Fringe Opening Party brought forth mighty morsels of cabaret to Madame Jojo’s for our delectation. The night was compered by the self-styled "moustachioed men of mystery" Moonfish Rhumba, one of whom is a dead ringer for 1970s heartthrob detective Jason King. Of the twelve or so showcase performances, six were from members of the burlesque troupe CheekOfIt, all of whom were making their debut. Having seen the finished articles last week at the Milk Club and Earl's Court Festival, we were charmed by the energy and innovation of these nubile newbies and wish them all the best. Ben Watson’s mission was simple: he wanted to tell us the history of the world in 5 minutes. While this might make him the world’s most popular history teacher, his act relied on two things - a continuous soundtrack of history-related song samples and his dancing, gurning and miming to said soundtrack. This came across more like an A-Level music project than something people would pay for. Pistol and Jack are, simply put, cabaret marmite. Pistol, a feisty American singer, makes it clear she is not in a relationship with Jack (a singer-songwriter-Londoner) which is just as well: their act consists of performing completely unrelated songs at exactly the same time. While Pistol sings tracks from Lady Gaga, Jay-Z, Eminem and The Killers, Jack plays and sings the songs of David Bowie and Lloyd Cole. This pair are a talented live mashup act that we enjoyed hugely but left some of the audience nonplussed or bored. Final act The Tootsie Rollers were well worth sticking around for. Although similar in sound to other modern all-girl Phil Spectoresque bands like the Pipettes, the way they twisted contemporary hits (“Don’t cha wish your girlfriend could bake like me?”) has already got us booking our places for their full Fringe show. Full details of the Alternative Fringe events can be seen here. 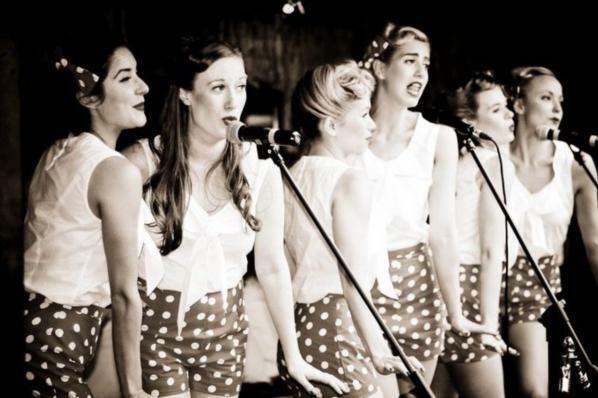 Photo of The Tootsie Rollers taken from a previous performance.